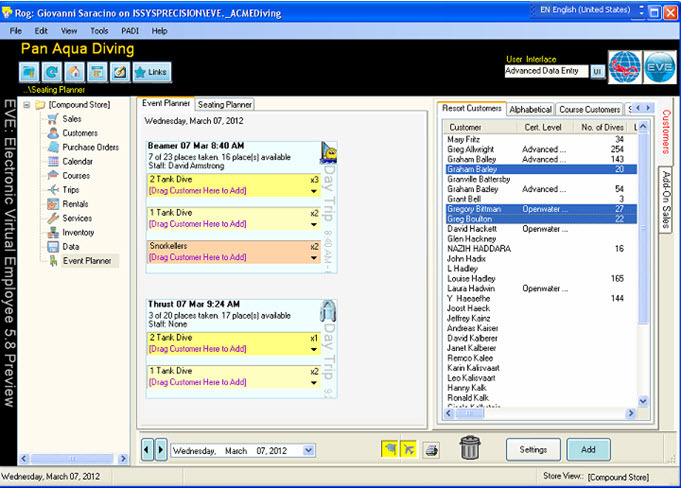 EVE has a dedicated module designed to deal with the complex logistics of running a busy dive centre or resort. The Event Planner provides a simple yet powerful interactive dashboard, giving visual representation of the range of activities you may have scheduled or underway in your busy dive centre or resort. The module has been designed and tested wth some of the worlds largest dive operators. The Event Planner caters for the smooth running of even the most logitical headaches that occur when dealing with and keeping track of a lot of people engaged in a range of activities over multiple days. Activties are easily referenced and shown on screen in a graphical form. The user friendly interface allow you to use the drag and drop function tool, simply drag and drop the customer(s) or group where you want or need them to be. EVE will move all of their relevent information over to the assigned new activity, course or trip. Invaluable, when submerged in the busy activtiy of a diving resort. To quickly sell places on courses, trips, pickups and accomodation, simply use the drag and drop feature. EVE will add ongoing invoices to the customers sales record ready for payment, either when checking out or at the time of assignment. EVE Resort features, have been designed and built, over a four year period working with some of the busiest dive operators around the world. The tools and functionality are designed to be simple enough for the staff at the manic front desk to use when submerged in activity and customer demands. While all the time, keeping track of equipment and taking care of the customer sales accounts and financials in the background to ensure you get paid.